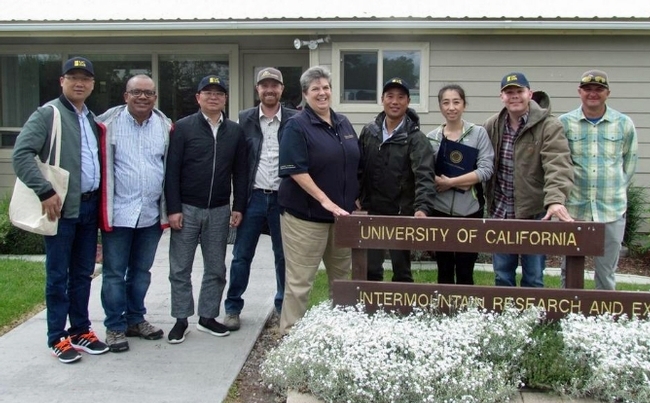 UC Agriculture and Natural Resources vice president Glenda Humiston welcomed a delegation of Chinese agricultural scientists to UC ANR's Intermountain Research and Extension Center in Tulelake in June, reported Danielle Jester in the Siskiyou Daily News. During her opening remarks, Humiston said Chinese farmers faced many of the same issues as those in the U.S.
"They are responding to global climate change, drought and pests while trying to improve food security and water use efficiency," Humiston said. "They see UC Cooperative Extension as an effective research model; we hope that scientific collaborations will accelerate solutions and help maintain relations for California agriculture with China." The group toured the Intermountain Research and Extension Center, the northernmost of UC ANR's nine research and extension centers.The 140-acre facility is four miles south of the Oregon border. Research at the center is focused on irrigated field and vegetable crops, weed, insect and disease management, water conservation and plant fertility. During the tour of the station, one of the Chinese scientists asked what factors the researchers look at to determine the health of the soil. In response, center director Rob Wilson listed the soil's nutrients, its bulk density, pH, organic matter content, carbon to nitrogen ratios, existence of microbes, and existence of disease in the soil, Jester reported.